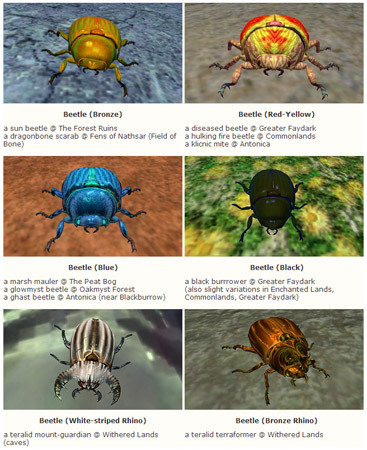 I’d like to take a moment and express my sincere gratitude to Ferrek who took my We Need Screenshots call to arms as a personal challenge and set out to document every Insect and Arachnid that could be found in Norrath! Every screenshot and note on the Insects tab (as well as numerous contributions elsewhere in the Warder guide) was submitted by Ferrek. I’m happy to announce that our Beastlord Warder Guide now sports 39 Insect appearances. Note: 6 of the appearances are “bone spiders” and right now, charming any of them results in a grey beetle, but hopefully this will get fixed soon. Also, perhaps I was a bit overenthusiastic, but I’ve added a black scorpion style for which we have yet to locate a tameable example. Best post ever Feldon, thank you for the recognition. Spent a lot of hours running around all the outdoor zones. WOW! Thank you Feldon and Ferrek!! Someone please tell me where and how I can get the quest to tame insect warders.